Monarch Air Group provides private air charter in Waterbury, CT. Our clients benefit from top-notch service, unrelenting dedication to safety, wide selection of aircraft, and years of experience in chartering private jets. To obtain a free quote, please use our online quoting tool provided below, or call toll free 1-877-281-3051. Monarch Air Group provides private jet charter flights in and out of Waterbury, Connecticut, USA. Being a historic brass-manufacturing center, Waterbury is an industrial city in western Connecticut, on the Naugatuck River. 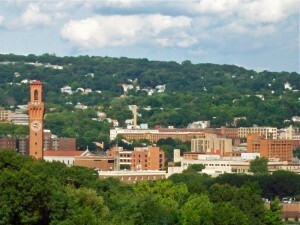 With a population of about 110,366, Waterbury is the fifth-largest city in Connecticut, the ninth largest city in New England, and the second largest city in New Haven County. The city is also home to Connecticut’s Consulate General of Portugal. The most notable tourist attractions are Union Station Clocktower, Apothecary Building, Municipal Stadium, Soldiers’ Monument, Carrie Welton Fountain, Hotel Elton, Waterbury Courthouse, Cass Gilbert Historic District, Waterbury Clock Company, and many others. The nearest airports are Tweed New Haven Regional Airport (HVN / KHVN), which is located 33 miles from the city, Bradley International Airport (BDL / KBDL), which is located 45 miles from Waterbury, and Westchester County Airport (HPN / KHPN), which is located 62 miles from Waterbury. 2. BAF, Barnes, Westfield, United States. 7. CEF, Westover Metro Arpt, Springfield, United States. 16. GBR, Walter J. Koladza Airport, Great Barrington, United States. 19. HFD, Brainard, Hartford, United States. 20. HPN, Westchester County Apt, White Plains, United States.